Grooming dogs can be a constant source of chagrin for many owners. Many elements, such as taking a bath or having their nails clipped, are likely to send your dog spiraling into a meltdown. How about trimming dog hair with human clippers, though? You can, but they aren’t clippers that are fit for purpose. And if you buy non-professional clippers online, they may be re-branded to appeal to dog owners. These will do a competent job, but if you plan to give your dog regular home haircuts, you should use professional equipment for the sake of your dog’s comfort. Dog grooming is a successful business for a good reason, but there will always be an opportunity to groom your dog yourself- if you have the patience and a steady hand! This article will discuss the art of amateur dog styling and how to groom a dog at home, and the difference between human clippers and their dog fur clippers. 1 What’s the Difference Between Dog Clippers and Human Clippers? 1.1 Can I Cut My Dog’s Hair with Human Clippers? 1.3 Can I Cut My Dog’s Hair with Scissors? 1.4 How Often Should I Groom My Dog? 1.5 What Dog Grooming Should I Do Between Haircuts? 1.6 Can I Use a Human Razor on a Dog? 1.7 Is it Better to Cut a Dog’s Hair Wet or Dry? 1.8 How Can I Make My Dog Enjoy Being Groomed? 1.12 Should I Visit a Dog Groomer or Them Come to My House? 1.14 I Took My Dog for a Groom, and Now They are Bleeding? What’s the Difference Between Dog Clippers and Human Clippers? 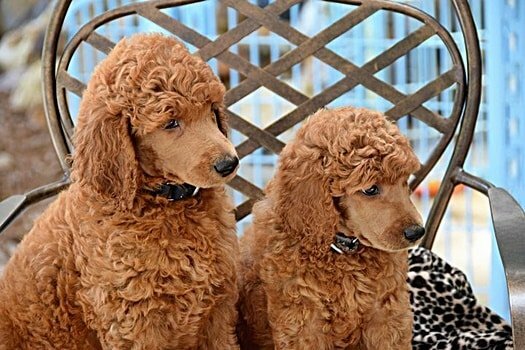 They can look identical to the untrained eye though, which is why some slightly unscrupulous manufacturers put a picture of a dog on a set of clippers designed for human use and market them to pet owners. The blades of human clippers are closer together. Dog clippers have sharper blades to quickly cut through tough, long fur. Dog clippers usually have a stronger, more powerful motor so that they will not get caught up in any tangles. As you can probably imagine, this means that you will have a great deal more success in grooming your dog with a pair of specialist, professional clippers than their human equivalents. If you plan on performing a home haircut for Fido, try to make sure that you are purchasing a set of clippers that are fit for purpose. Can I Cut My Dog’s Hair with Human Clippers? It can be done, but if at all possible try to avoid doing so. Human clippers struggle to make their way through thick, sturdy dog fur, which means that you may be inadvertently inflicting pain upon your dog. You’ll have to keep pushing and pulling to get the clippers through the fur, and you’ll end giving your dog an uneven, ragged haircut. In addition to this, professional dog clippers will also provide more choice for you regarding the length of the blade. You can tailor the blade and head of the clipper to your dog’s particular fur requirements, and move the clippers with a great deal of ease. Stubby, shorter blades will struggle to perform the task at hand. Professional canine clippers may be more expensive than their human counterparts, but there is a good reason for this – they are more fit for purpose. Sometimes you get what you pay for, and your dog will be grateful to you for digging a little deeper into your pocket. If you have to use human clippers on your dog, you can do so. You’ll have to be patient and work slowly and methodically, making sure that you are not inflicting any pain upon your pet as you work on their fur. Select the length of the clippers that you need, based on the thickness of your dog’s fur and how much you want to take off. Brush your dog’s fur before you start, so there are no tangles to contend with. Slowly, carefully and methodically, push the clippers against your dog’s fur coat. Work in the direction of growth, rather than against. If you come across any resistance, which is quite likely with human clippers, don’t try to force the issue. Pull away the clippers for a few seconds then try again. When you are satisfied that you have finished with the clippers, tidy up your dog’s paws, eyes, nose, face and other delicate extremities with a pair of scissors. Be very careful here! Once you’re done, let your dog go and offer them their favorite treat for being such a good boy or girl! Finally, we’d like to sound a note of caution surrounding the word ‘shave.’ It may be tempting to shear a longhaired breed completely during the summer months, especially if they are showing visible signs of distress and overheating. This is hugely inadvisable, as it can lead to very nasty cases of sunburn without fur to protect your dog’s body. Leave at least one layer of hair in place. Can I Cut My Dog’s Hair with Scissors? You can if you have a great deal of patience, an uncharacteristically static dog and the ability to ensure that everything will be even once you’re done. It’s probably not advisable though unless you are a trained professional groomer! 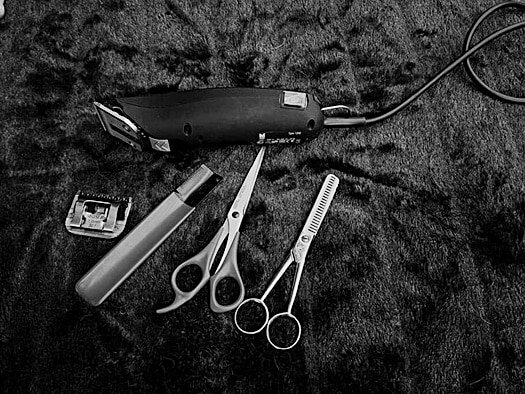 That isn’t to say that scissors have no part in dog grooming – they are an essential component of any kit. You should start with an electronic clipper and tidy up with scissor afterward, though. The American Kennel Club recommends having your dog groomed around once per month, but that depends on a variety of different factors – including your dog’s size and breed, your available budget, and the schedules of both yourself and a professional groomer should you decide to use their services. Not every dog will need their hair cut every few weeks, though. Some breeds can wait several months between clippings. If this applies to your particular pet, it’s not a license to ignore other fundamental hygiene needs, though. There is more to dog grooming that taking a pair of clippers to a canine fur coat. What Dog Grooming Should I Do Between Haircuts? Bathing. Sure, your dog hates the bath, but they need to be kept clean! Try to shampoo your dog at least once every six weeks. Paws. Keep an eye on your dog’s paws. If they start to smell, give them a wash between baths – and also trim nails as soon as they start to click-clack on the ground. Fur Brushing. All dogs need their fur brushed regularly – roughly every 24 hours – to prevent tangles from forming. Luckily this hugely relaxing for your pooch, and is a great way to strengthen your bond. Eyes. Some dog breeds are prone to hair growing around and into their eyes, and others have faulty tear ducts that lead to staining. Remove these tear stains, and carefully trim the fur around your dog’s eyes with scissors if necessary. Rear Ends. Dogs have hairy behinds, and if you find that your pooch seems to be disproportionately licking their bottom it be that they do not feel clean after eliminating. Trim a patch around the area to prevent this from happening. Parasites. Finally, be vigilant about checking your dog for any sign of a parasitic invasion. Fleas, ticks or worms should be dealt with immediately. It can be a lot of work to stay on top of a dog’s grooming regime, but that’s part of what you signed up for when you agreed to bring your furry family member home. Can I Use a Human Razor on a Dog? We are sincerely hoping that you didn’t ask this question, and if you did it was entirely rhetorical. Either way, the answer is no. It doesn’t matter how calm or well behaved your dog is, there is every chance that they will wriggle around and fidget while being groomed. Maybe something tickles them, maybe they’ll hear a strange noise and instinctively want to go and investigate, or maybe they’ll get bored of standing still while you groom them and the supply of bribery treats have dried up. Whatever the reason, your dog may well go for an impromptu walkabout while you’re grooming them. Do you want to be holding a sharp implement against their body while they are doing so? If your dog needs a patch of fur to be trimmed away ahead of a surgical procedure or something similar, leave it to the professionals. Vets have sedatives for a reason. Is it Better to Cut a Dog’s Hair Wet or Dry? Wherever possible, keep bathing and washing separate from grooming. If you must do both at the same time, you should follow the path of a professional groomer – blow dry your dog’s fur until it’s waterless before progressing any further. Most dogs hate being wet, and they hate being groomed. Put the two together, and you can understand why they will be somewhat peeved! Brushing wet hair on a dog leads to more tangles – which can be very painful and awkward to get out. Wet dog fur should never be touched; if you can, leave at least 24 hours before bathing and grooming. In theory, there is nothing to say that you cannot give your dog a shower after grooming them to get rid of any stubborn fur clippings that are hanging around but consider your pooch’s feelings in this. They may have had quite enough excitement for one day, and have earned a treat on their favorite cushion! How Can I Make My Dog Enjoy Being Groomed? You can’t make a dog enjoy being groomed if they are not that way inclined, any more than you can make a human child (or adult!) enjoy visiting the dentist. The best that you can hope for is to make the experience as tolerable as possible for your pooch. 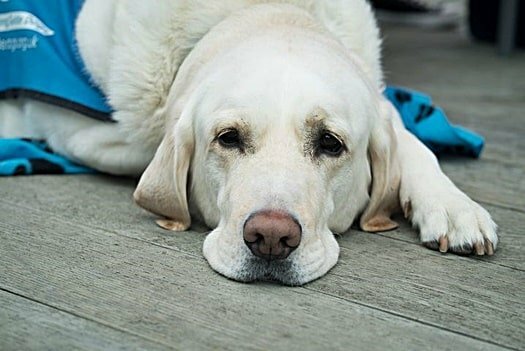 That means plenty of calming techniques – and staying calm yourself – no matter how annoyed you get by your dog’s whining, crying, wriggling and scratching, losing your temper will only make things worse. Also, try to bring in a second pair of hands wherever possible. Your life will be considerably easier if somebody else can restrain the dog as much as possible, while simultaneously offering a wide range of treats in an attempt at bribing them into remaining calm and still while you do what needs to be done. This is very normal, unfortunately – being groomed is quite frightening for many dogs, and they’ll do whatever they can to avoid the experience. There is a reason why many people prefer to take their dog to a groomer. Professionals shave with a calming bedside manner. That means they can calm your dog down (and the experience of being scratched and bitten that means they’ll tolerate it if your dog remains panicky! ), will be equipped with all the restraints that may be needed to hold your pet in place. And they’ll have all kinds of equipment – including, yes, professional dog grooming clippers. If this happens, stop the groom at once and let your dog free. It doesn’t matter if they’re going to have a slightly lop-sided haircut for a while; they need to let off some steam and remove themselves from this pressure cooker of a situation. Then clean up your wound, and concentrate on making friends with your dog again. You can revisit the idea of grooming, whether it’s yourself that tries again or a professional, at a later date. There are rules of etiquette that you should follow when taking your dog to a groomer. Don’t take your dog to a groomer is they are sick – they may not infect the human doing the job, but they could pass on a virus to other canine clients. Likewise, try to avoid taking a dog to the groomer unless their vaccinations are up to date, as you never know who else is in the waiting room. If your dog is prone to aggressive behavior, tell the groomer about this before they agree to take the job. It’s up to them as to whether they place themselves at my kind of risk by engaging with an aggressive animal. If your dog is largely well behaved but tends to be fidgety, inform the groomer so they can book a slot where they will have a co-worker on hand to help if necessary. If your dog has any allergies, tell the groomer before they start. Groomers often use scented dog shampoos and perfumes, so they’ll need to know if such a product will cause a flare-up on your dog’s skin. If your groomer asks you to leave the room and get out of sight, so your presence does not distract your dog, do as they ask. It’s for your own good in the long term. Be clear with the groomer about what you want; don’t expect them to read your mind. If you want your pooch shorn for the summer, tell them so – don’t just complain when you pick them up that this was the one time that you wanted a number 2 clipper used! Perhaps above all, never forget to take your dog to the bathroom before they are dropped with the groomer. All the nervous energy and excitement of being groomed could lead to an accident if your pet has a full bladder, and your groomer will have enough on their plate with the haircut without having to clean that up too! Should I Visit a Dog Groomer or Them Come to My House? This entirely depends on your circumstances and your dog’s personality. Most mobile groomers will have everything that they need to use on the move, including restraints. However, you may prefer not to be saddled with the cleanup afterward (the groomer will tidy up after themselves, but any pooch parent knows that dog hair can somehow end up everywhere), and you may prefer that your dog does not associate their home and sanctuary with scary experiences such as haircuts. Make a judgment call based on your hound’s personality. Being groomed can be an intense experience for some dogs, so cut your pet a break if they get a little frantic surrounding the whole thing. If you’re going to take them to an external groomer use similar calming techniques as you would at the vet’s office; ensure that your dog has exercised to tire them out, and aim for an appointment first- or the last thing to avoid your dog being wound up by other hounds in the waiting room. Naturally, though, sometimes accidents may happen and your dog may bite a groomer. If this happens, remain calm and apologize to the groomer in question – and respect their decision on what happens next. Your groomer may laugh off the whole experience, possibly electing to not even tell you about it, or they may ask you to collect your dog and not book them in again. As we have said, if you receive the latter response you will need to respect this – don’t make a scene. I Took My Dog for a Groom, and Now They are Bleeding? Take this up with the groomer in a calm, reasonable fashion. In an ideal world, the groomer in question will inform you themselves, full of apologies. You should accept this apology and move on – after all, you have presumably brought your dog to a professional because they are so wriggly, and that means that accidents will happen. If you notice a cut on your dog upon collecting them from the groomer and they deny all knowledge and responsibility, tread carefully. You will have no proof that this was caused by the haircut, and you could be on thin ice if you make accusations. If your dog is otherwise unhurt, take them away and don’t revisit the same groomer in the future! Grooming a dog is never a simple or easy process, but it’s a necessary one. 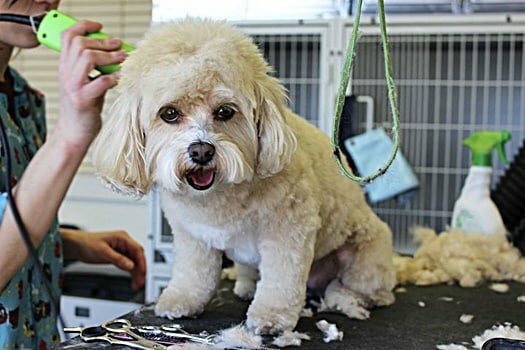 There is no need to take on the challenge yourself if it isn’t something that you feel comfortable with, but regular trips to a dog groomer can prove costly. If your dog needs regular trims, it may be a better use of your budget to invest in a set of professional quality clippers and learn how to complete the process at home. Of course, this is assuming you have the confidence and ability to do so! If you have any doubts at all, it may be best to bite the bullet and arrange a trim with your local groomer. When it comes to dog grooming, the path of least resistance is often the one that leads to a mutually satisfying conclusion.